We’ve met Hailu Mergia on a Sunday (August 9), the next day after his incredible performance at the OFF Festival in Katowice, Poland. He played in a trio with Mike Majkowski on the double bass and Tony Buck on drums (who was replaced with Paweł Szpura). They played at 2 AM and their show ended a phenomenal day. At first I thought that was wrong, cause everybody would be tired after a crazy time and it was going to be a sleepwalk. What came next was the crazy time: everybody danced their brains out. The energy was overwhelming, and I wouldn’t think I’d come to say this, but after the third encore, on the way to the hotel, I didn’t feel the need for another drink, just sleep: I was at peace. So I had another beer to celebrate and went to bed… The next day I was going to meet the man. Victor Stütz: How did you hook up with Tony and Mike? 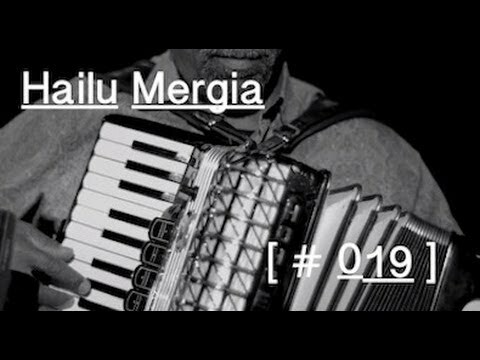 Hailu Mergia: In 2013 my manager, Brian (Brian Shimkovitz - Awesome Tapes from Africa) contacted me and we had a discussion about a show, a tour. Then he contacted Christoph Linder (Planet Rock booking and promotion), but they knew each other, and then Christoph talked to the drummer, Tony Buck, and Tony brought Mike Majkowski, the bass player. That's how we started. So did you know anything about them before? HM: No. I was just told that they are good musicians, so I said OK. But, you know, at first, my plan was to form a band; a full band. But they said no, we can't bring over a full band because we don't know how it will work, you are a new guy...and all the other reasons, you know. So they said why not start with a trio and then if things are getting better we can go to the band. First we have to take the risk with the trio. And now after working, we just forgot the band now, and I love it and everybody loves it. But the band will come sometime. HM: Oh, yeah, we don't know. Could be. 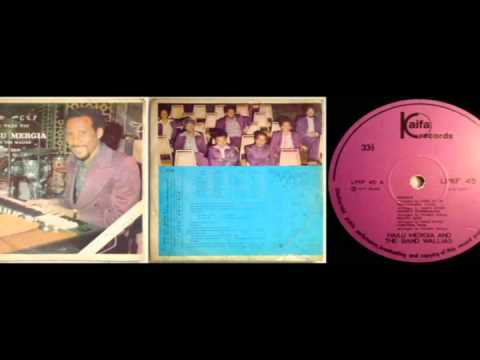 Do you have any plans to hook up with some old Ethiopian musicians? HM: I have one idea but we have to talk when the time comes, because maybe I can bring some musicians for a show or something, but to do it all the time… the trouble is that it's too expensive, so I can't tell you right now, but I have some ideas for the future. When did you last play in Ethiopia? In Addis? HM: 1981. I travel to Addis every year, in January, for 2 or 3 weeks. I just go there for visiting. But I never play when I go there. There are lot of concerts in Addis, a jazz festival and every year they have different things... But I never play there. HM: I might do that. God knows. Do you like the music of the new generation? HM: There is some music in the new generation that I love and music that I cannot say I don't like, but it's not my favorite. So the only thing that I can say is that everything goes to the generation: in my generation we were doing something different than the old generation, and now, the new generations make something different than our generation. And when they do it, sometimes they do it their way, sometimes they do it the way that we did it, so there are so many things that I cannot say now that I don't like or like because everybody is doing things in their way. It's up to them if they do a good job, if they do it in a good style and love it. Some of them are influenced by you. HM: Yes, especially keyboard players. 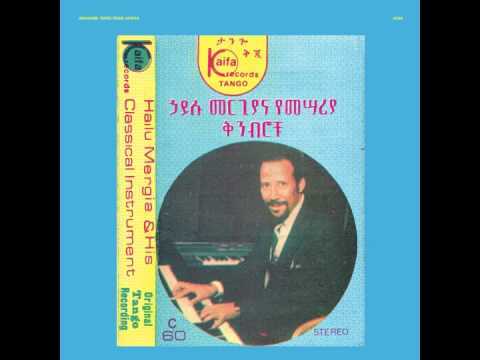 Even in my generation there used to be musicians who were influenced also by me, because in Ethiopia I was the first person who started playing the old songs on organ. There were some musicians who played on piano with a band or instrumental piece, but I was the one who started playing by organ and after me there were a bunch of keyboard players who became interested and influenced. 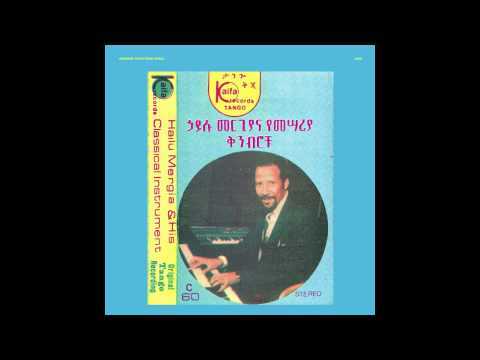 Can you tell us about the Ethiopian classical music that you took further? HM: The way how we do this, in Ethiopian music, of course, I'm the one that started on organs, but the instrumental pieces I cannot say I'm the one who took it further, because Mulatu - he did also an instrumental and a lot of musicians did different ways in their time with an instrument and all that is involved to this style, so I passed a little portion of it. And the traditional music that you were influenced by is it still played in Ethiopia? HM: Oh yeah, yeah. When I started to do the recordings on cassette, I picked up the old songs and just changed any kind of intro and did it my way, so that part is still going to be like the way I knew it. A lot of musicians - they pick up some old songs, what I did before or maybe some that I am going to do also, because Ethiopia's got a lot of old songs. We have a bunch of music in there and it's very hard to do everything, but the idea is to still working; a lot of musicians do the same thing. Of course some musicians now, even myself, start composing and do new material. So there is new material now and there is old material from the 70's and everybody is sharing almost like a standard tune. If I play one song this way, somebody is going to come and play the same song in a different way. I played some old songs with a band and somebody is coming now with a new generation, with synthesizers. But it's still the old songs. When you started were there recordings of music that you listened to? HM: I listened most of the music on the radio. Back then I was playing in small clubs - not like what we have nowadays - and I would go to the clubs and then I would go from one door to another door to listen what is the most popular song. And then I would pick up that popular song and it would work well! How was the nightlife back then, was it crazy? HM: Oh, the nightlife back then...it was good! Of course it goes on in cycles... back then you know everything was kind of like… you know… good times… like soul music generation time, James Brown, Aretha Franklin, everybody! That was the soul time and blues time so it was a nice time playing in a club and things were very beautiful but there were not really too many clubs, there were bars and small restaurants, but it was a nice time. HM: All things changed starting from the mid ‘60s, because now the business was getting better and better, people started going in nightclubs and instead of going to a restaurant they wanted to have restaurant + club and then the parties. The main part is also that there were not enough civil musicians, like free musicians, because culturally to be a musician was so embarrassing. A family never wanted to have sons who were musicians and because of that most of the people, even if they wanted to play music, they were not really very sure because of their families. So there's a lot of music in clubs played by government musicians like army musicians or police musicians, National Theater musicians, you name it! All these guys in the weekend they go in the club and they play. In my generation a lot of musicians came out from the closed curtains and started playing. I'll give you an example: I was first a singer. We used to work in bodyguard army, bodyguard music department. The club is closed at 3 o'clock and then another guy has to go to work at 9 o'clock in the morning, so because of that he is kind of a busy guy. At 2 o'clock you take a break, and the accordion is sitting there, looking for somebody. I knew just one song, that I will never forget, and I played that song and then, the other musicians asked me why don't you learn to play more songs? So I started going to rehearsals every time and started learning more and more and then, all of a sudden, that guy was fired, so I took his place. That's how it happened. HM: No, I grew up with my mother, a single kid. My mother doesn't like it, but you know, your mom is your mom. She said okay, if you want to do it then okay. And it's not only that, you know, when you are young, you are wild; she couldn't control me anyway. She had no choice but she gave me good advice. Did you listen to American music and jazz and all that? Was it easy to find it on the radio? HM: I did listen, yes. After that I was playing different nightclubs, finally. In 1963 we formed one group-band. That was like a really hard time to have soul music, so there were some stores that imported lots of albums. We just went there and buy, and some clubs would play records and so we would just pick the popular song, and then we would study it from the LPs; we didn't write it down, we would just listen and pick up part by part. We sometimes introduced very strong music, but that's how we would play the new Western music, and we were really good for that, really good. Actually, we were creating soul music and blues and jazz, more than we were creating Ethiopian music. Is there anything written till today? HM: What I know is just here (points to his head). I know how to write music, but I'm not really what you call a prima vista. If I have to write it down, I write it down my way and I keep it there, and anytime I would need to look for something I would grab it. How did you make so many recordings, the tapes, the production? Were there any studios? HM: There was one studio, which was not really good, and there was another studio - like a gospel radio station - so there were very few recording studios and the quality was no good. So what we would do was like we had a very nice sound system in the club where we played. The owner of the music store just came up with the old reel-to-reel recorder that we hooked up to the system and we recorded. We didn't have to do it in the studio, just in the club. 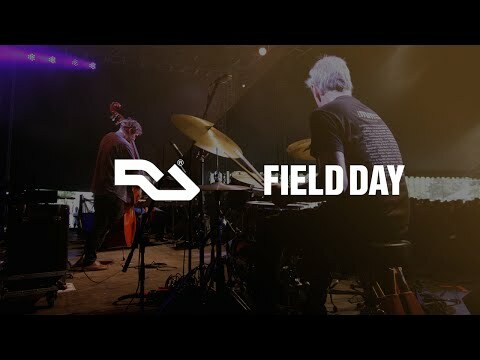 A kind of live, but when you have this kind of recording you don't have channels, everything comes out already mixed, no mastering. Just one time and that's it! When we finished everything we just gave him the cassette or the reel to reel to put it in the store; we just had to get our money and he gets the CD and “bye, bye”, no copyright, no nothing, because that was business back then. He already paid once. Of course nowadays things are not like that anymore. Why did you leave Addis? HM: I left in late ‘81. There was a guy from Ethiopia who used to have a club in America and he invited us when we were playing in the Hilton Hotel (in Addis). We were playing there for many years, it was like the top hotel you could reach, so to play there was like a big thing. And then this guy from Washington DC sent us a contract for a tour in America. I signed the contract and came to America for the tour. We toured for two years, traveling, and that's how I came to America. HM: Not really. There were not too many Ethiopians living in America. This guy was not such a good agent to contact other crowds; we were just playing for Ethiopian communities. How was your first contact with America? What happened after these 2 years? HM: We tried to promote ourselves with another friend, we bought a van and started traveling. You started playing again 2 years ago, what happened in the meantime? Let's say, when I stopped playing music in 1991, I was in a restaurant business with my friends. I had an African club. Then I ran that business until 1997, and then after that the place was closed and then I bought a car and went to the National Airport, the Dulles National Airport, and got a job there riding a taxi. The Airport business is different from the City Taxi, because as city cab you have to drive all around the city to make money, but at the airport you drop one guy and you just come back to the airport, you stay there, so you have like maybe half an hour or an hour, depends what time you go, but at least an hour you sit in the car. So instead of sitting and waiting, I said to myself why not buy a keyboard?. So I bought one, which works with batteries, and then I just put it in the trunk. Even now, whenever I buy a car, first I have to look at the trunk to be big enough, because I want to make sure I can put that keyboard there. So I put it in there, then I drop the customer, come back to the airport, I put my number on the screen and until my number is called, I have a place away from the taxi station. I go there, pick up my keyboard, sit in the back seat and practice. I still do. You first came to Europe two years ago. How did you find Europe? How is the public different from the States or Ethiopia? HM: My first show started in Germany 2013 - November 28. I’ll never forget that date. Don’t ask me why, I know why. (laughs) The Europeans listen more to outside music, to different kinds of music. In America they do it too, but more so in Europe. I don’t know the reason but that’s how it is. Do you have a story from taxi driving? Oh, that’s Hailu Mergia - the one that is playing organ? Yes it is. Oh, we didn’t know you are driving a taxi! Yeah, I drive a taxi, what’s wrong with that?! It’s a job! But I don’t blame them because some of them don’t know that I’m living in America so it’s not really a bad thing they’re asking this question when I drive a taxi. So that’s the only experience I have. So taxi driving is a quiet life, right? It’s not like in the movies. HM: No, in real life it’s not like that. I used to work different kind of jobs in America but there is a reason I’m in the taxi business, to be honest. One is the freedom - I do it according to my schedule - I can drive anytime, I can stop when I want. For my profession I need that kind of job. I am my own boss. And the other part is you never get broke, you always have money in your pocket, that’s the main thing! Listen, you stay at home and your wife or somebody comes (a friend) and says I want to get a drink, I want to drink beer or eat something and you don’t have money… OK! Wait for two hours. And then I go to the airport, make some money, come back: we have a good time! Simple! Why bother? You don’t have to wait for your paycheck, borrow from your friend or your parents; you don’t do that when you drive a taxi. You go out, you don’t have to be very smart. When I play music I’m different, when I drive a taxi I’m a different person! I’m living in two different worlds and I’m comfortable with that. As long as I pay my mortgage, my car payment and I can cover all expenses, I’m a man to do any kind of job. What about a story with music? You said you’d never forget the first time you played Europe. HM: Yeah, the first time. There are so many things that happened to me that have a good part and a bad part… So, OK, Europe: in 2013, after organizing the trio I came to Berlin for a rehearsal with Tony and Mike. As musicians we understand each other perfectly. But for me, the first night-show was a kind of question mark; believe me! The question was: people, they like my music but what would happen’ if they don’t like it? When things are getting further, serious, and the media is asking a lot of questions… you didn’t play for that long… ta-ra-ra, ta-ra-ra… Everybody’s asking me something, and then, all of a sudden, I became nervous! This was the first show, at a club called Kit Café in Düsseldorf. When I saw the club, it was full house! Now I know I’m in a real situation here, so what I have to do is… I just hold myself from nervousness. Who cares? Just do it. After the first piece I listen to all this cheer, then I was, I don’t know, I couldn’t explain to you what kind of feeling I had. I was so excited… I couldn’t believe what I saw! Anyway! So the show finished and I went to my room… I couldn’t sleep! I was so happy! My heart was beating like crazy because I said to myself after 22 years - this kind of response from the public, I was… to the extreme… so I order beer in my room. By the way, I don’t drink before the show, ever! So I drink two beers. I try to sleep. I couldn’t sleep! Then I call home to my wife and I tell her the story and she’s like: What happened? You broke up, why are you so nervous?! No, I cannot sleep. Why?! Because I’m so excited! OK, go to bed. No, I can’t, talk to me!!! Drink a beer! I drank! It was really so funny! You know, I never had that kind of experience! It was really once in a lifetime! I still feel nervous now when I think about it. Some people - when they win a million dollars at the lottery, they are so excited they just die! He wins and he’s so happy, jumping up and down and all of a sudden they die! Happiness is sometimes more than you expect. When you see people dancing, that’s more important than money. There are a lot of big musicians who are not rich; but they are mentally very rich. For me, money comes secondly; I want to see you are cheering. That’s why I’m so happy. Mentally I’m very rich!